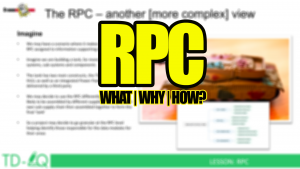 S1000D and the RPC (Responsible Partner Code) - What, Why and How? Next FAA v MRO, Galileo Project, ALTAY, No More handbooks! Our latest short tutorial was inspired by a TD-iQ subscriber asking if the adoption of the Responsible Partner Company code (RPC) was correct on their project. This was a sensible and reasonable question which many projects have had over the years. On the face of it the RPC is a easy and quick decision, but have you considered what S1000D is telling you? Have you thought about the implications on the project and why getting it right is vital and using a sensible approach aids in the project management of a large, complex S1000D project. Full TD-iQ subscribers can watch this short (20 minute) tutorial as part of your subscription via your TD-iQ dashboard, if you are not a TD-iQ subscriber and would like more information on how you can access this and many other similar tutorials, please see the options on our membership page.